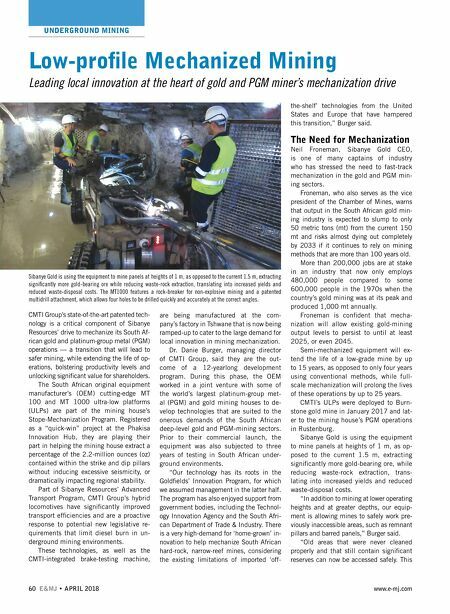 UNDERGROUND MINING 60 E&MJ • APRIL 2018 www.e-mj.com CMTI Group's state-of-the-art patented tech- nology is a critical component of Sibanye Resources' drive to mechanize its South Af- rican gold and platinum-group metal (PGM) operations — a transition that will lead to safer mining, while extending the life of op- erations, bolstering productivity levels and unlocking significant value for shareholders. 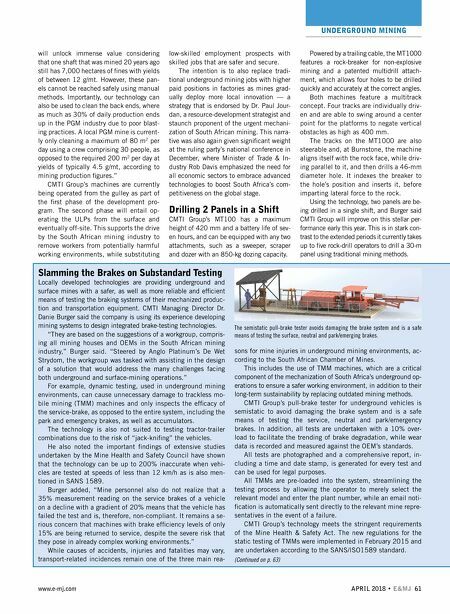 The South African original equipment manufacturer's (OEM) cutting-edge MT 100 and MT 1000 ultra-low platforms (ULPs) are part of the mining house's Stope-Mechanization Program. Registered as a "quick-win" project at the Phakisa Innovation Hub, they are playing their part in helping the mining house extract a percentage of the 2.2-million ounces (oz) contained within the strike and dip pillars without inducing excessive seismicity, or dramatically impacting regional stability. Part of Sibanye Resources' Advanced Transport Program, CMTI Group's hybrid locomotives have significantly improved transport efficiencies and are a proactive response to potential new legislative re- quirements that limit diesel burn in un- derground mining environments. These technologies, as well as the CMTI-integrated brake-testing machine, are being manufactured at the com- pany's factory in Tshwane that is now being ramped-up to cater to the large demand for local innovation in mining mechanization. Dr. Danie Burger, managing director of CMTI Group, said they are the out- come of a 12-yearlong development program. During this phase, the OEM worked in a joint venture with some of the world's largest platinum-group met- al (PGM) and gold mining houses to de- velop technologies that are suited to the onerous demands of the South African deep-level gold and PGM-mining sectors. Prior to their commercial launch, the equipment was also subjected to three years of testing in South African under- ground environments. "Our technology has its roots in the Goldfields' Innovation Program, for which we assumed management in the latter half. The program has also enjoyed support from government bodies, including the Technol- ogy Innovation Agency and the South Afri- can Department of Trade & Industry. There is a very high-demand for 'home-grown' in- novation to help mechanize South African hard-rock, narrow-reef mines, considering the existing limitations of imported 'off- the-shelf' technologies from the United States and Europe that have hampered this transition," Burger said. The Need for Mechanization Neil Froneman, Sibanye Gold CEO, is one of many captains of industry who has stressed the need to fast-track mechanization in the gold and PGM min- ing sectors. Froneman, who also serves as the vice president of the Chamber of Mines, warns that output in the South African gold min- ing industry is expected to slump to only 50 metric tons (mt) from the current 150 mt and risks almost dying out completely by 2033 if it continues to rely on mining methods that are more than 100 years old. More than 200,000 jobs are at stake in an industry that now only employs 480,000 people compared to some 600,000 people in the 1970s when the country's gold mining was at its peak and produced 1,000 mt annually. Froneman is confident that mecha- nization will allow existing gold-mining output levels to persist to until at least 2025, or even 2045. Semi-mechanized equipment will ex- tend the life of a low-grade mine by up to 15 years, as opposed to only four years using conventional methods, while full- scale mechanization will prolong the lives of these operations by up to 25 years. CMTI's ULPs were deployed to Burn- stone gold mine in January 2017 and lat- er to the mining house's PGM operations in Rustenburg. Sibanye Gold is using the equipment to mine panels at heights of 1 m, as op- posed to the current 1.5 m, extracting significantly more gold-bearing ore, while reducing waste-rock extraction, trans- lating into increased yields and reduced waste-disposal costs. "In addition to mining at lower operating heights and at greater depths, our equip- ment is allowing mines to safely work pre- viously inaccessible areas, such as remnant pillars and barred panels," Burger said. "Old areas that were never cleaned properly and that still contain significant reserves can now be accessed safely. This Low-profile Mechanized Mining Leading local innovation at the heart of gold and PGM miner's mechanization drive Sibanye Gold is using the equipment to mine panels at heights of 1 m, as opposed to the current 1.5 m, extracting significantly more gold-bearing ore while reducing waste-rock extraction, translating into increased yields and reduced waste-disposal costs. The MT1000 features a rock-breaker for non-explosive mining and a patented multidrill attachment, which allows four holes to be drilled quickly and accurately at the correct angles.